Gangemi Racing :: Super by Name . . .
Super by Name . . .
Gangemi Racing has been a fan of the Redoute's Choice gelding Super Maxi for a long time after spotting him running some great races in Sydney metro class. In fact he was nearly purchased in early 2017, but a wind problem ensured that he didn't pass the mandatory vet test. Move forward over 12 months and a wind operation meant that Super Maxi was perfect to go and the stable jumped in as soon as he was available. 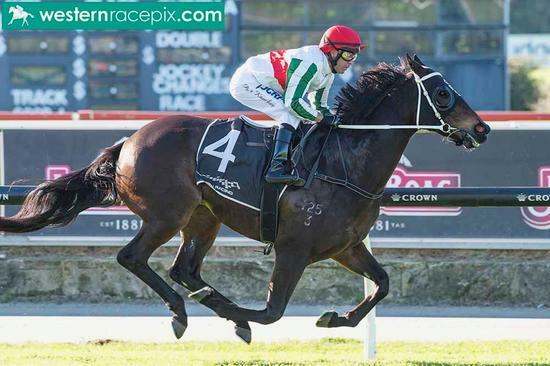 And the decision was well and truly justified on Saturday when the "well-supported" gelding raced first up at Belmont and blitzed a strong field of Perth sprinters by 2 lengths over 1000m in the slick time of 58.secs. Taken to the front from barrier 2, stable jockey Peter Knuckey rode the gelding a treat and he booted away down the straight to give the opposition no chance coming home his last 600m in 33.56secs. As per usual, Gangemi Racing has ensured a big group of owners in this gelding and the cheering could be heard across the course. He has been a great value buy already and the GR "crew" are going to have some great times cheering him on in the coming months!